Animal rights activism has long been on the rise in mainland Europe. Nowhere had this been more true than in Italy. In April 2012, activists stormed the Green Hill breeding facility and “liberated” a number of beagles from the facility. Since then they have threatened and harassed pharmaceuticals and breeders. In April 2013, five animal rights extremists broke into the University of Milan and coerced the university into giving away over 100 animals. For many scientists, this was the last straw. 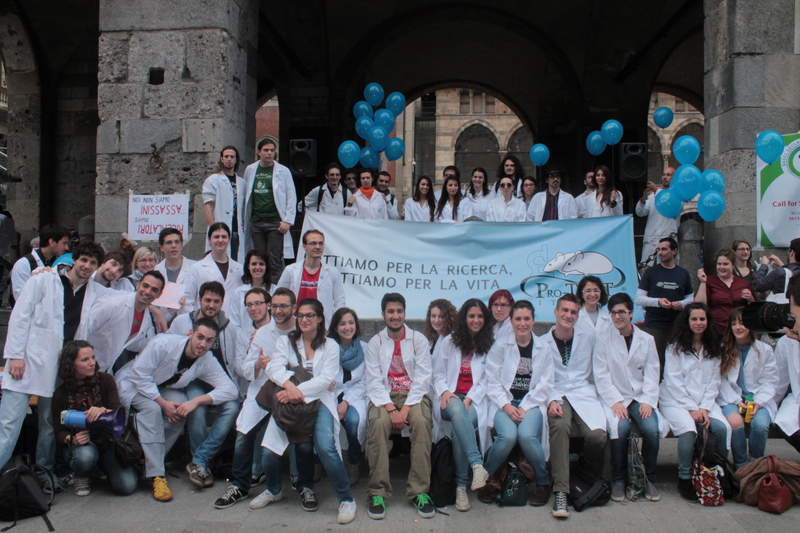 Researchers across Italy, under the banner of Pro-Test Italia (formed November 2012), organised a rally in Italy for Saturday 1st June. 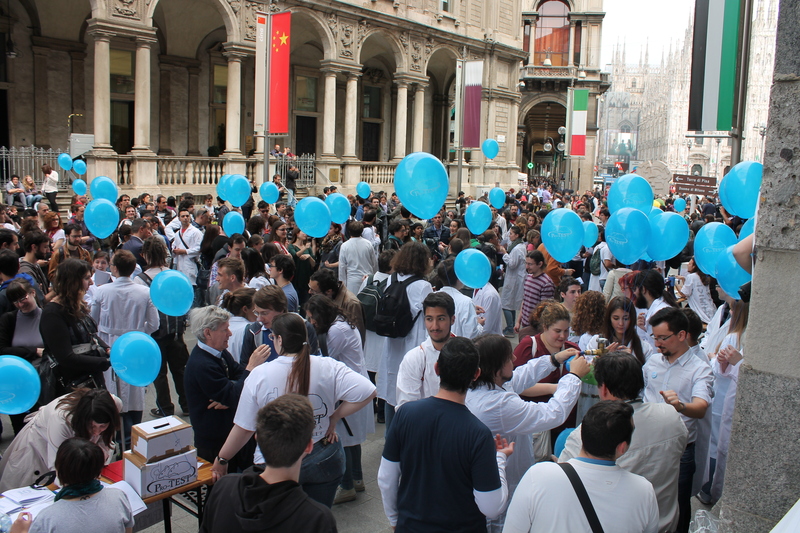 So on a cloudy day in central Milan, hundreds of scientists, researchers and students gathered to celebrate the important role of animals in medical science. At 2.30pm the Pro-Test Italia committee gathered at the Via Mercanti, by the iconic Duomo di Milano. A sea of balloons bearing the Pro-Test Italia logo were inflated and passed out to the growing number of attendees. As scientists chatted amicably about the importance of biomedical science, many took the opportunity to take photos. As the chants died down, another set of voices could be heard. Animal rights activists from the groups “100% Animalisti” and “Animalisti Indipendenti” arrived with outdated photographs and ill-informed ideas to counterprotest. Rather than enter into the spirit of reasoned debate, the activists, many with masks over their face, tussled with the hastily-formed police line and attempted to break through into the rally (they succeeded several times before being dragged away by police). Dr Dario Padovan, emcee of the day’s events, opened proceedings by riling up the crowd behind animal research. 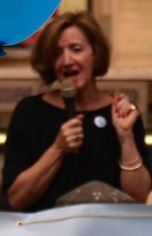 He quickly introduced Pro-Test Italia president Daria Giovannoni. 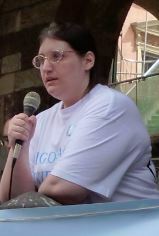 Daria Giovannoni gave the opening speech, thanking everybody who helped making such a day possible as well as explaining the importance of speaking up on this issue. Like subsequent speakers, Daria remained unphased by the attempted interruptions of nearby animal rights activists. After a rapturous applause, Dario introduced Dr Alessandro Papale. Dr Papale noted that it was the first time that scientists in Italy had begun to explain to the public what animal research involves. 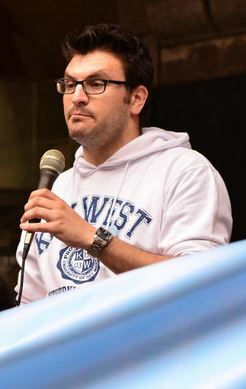 Furthermore, he said that researchers, scientists and professors must assert their rights since Italian politicians, sadly, appear to be listening to the activists who shout the loudest. 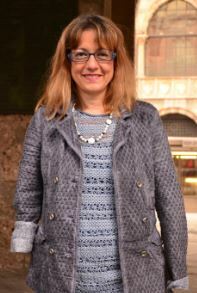 The next speaker was Professor Nicole De Rosbo of the University of Genova. De Rosbo has worked for years in the research against multiple sclerosis. In her speech, she spoke of the great strides in understanding the symptoms and time course of MS made possible through animal research. Without proper cures, people suffering from MS will be stuck in wheelchairs for life. After motivating the crowd further, Dario Padovan introduced Dr Nadia Malavasi, the honorary president of TAIonlus. Nadia, a victim of the thalidomide tragedy herself, explained how the lack of proper animal research prior to the roll out of thalidomide (a morning sickness drug) was to blame for the disaster. This puts paid to the contrary claim by animal rights activists. 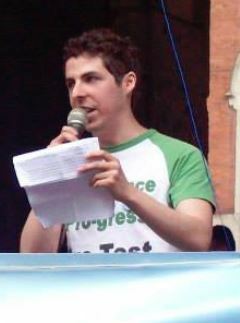 Tom Holder, founder of Speaking of Research and member of the original Pro-Test movement, was next to speak. 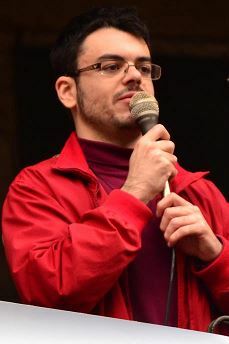 As the only speaker who lacked Italian he was translated by Dario Padovan. Holder spoke of his excitement at this new movement in Italy, but warned against complacency – both researchers and institutions must capitalise on this opportunity to speak out about the important work they do. The next two speakers were Giuliano Grignaschi, head of the Animal Care Unit at the Mario Negri Institute and Ambassador for the Basel Declaration Society, and Bice Chini, a neuroscientist at the University of Milan . 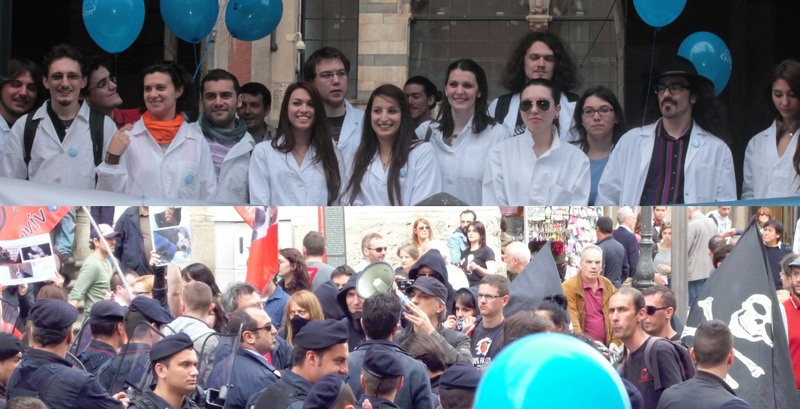 When news of the attack on the University of Milan came to the ears of the Basel Declaration Society, they organised a Call for Solidarity with the affected scientists. This struck a chord with many in research, and in a few days the call had attracted over 5,000 signatures. During the speeches, this Call for Solidarity was handed over to Dr Bice Chini (from the University of Milan) by Giuliano Grignaschi (on behalf of the Basel Declaration Society). After some more motivational speeches by the host, Dario Padovan, he introduced Alberto Ferrari, a fellow Pro-Test Italia member and neurobiologist working in molecular medicine and behavioural neurobiology at the University of Sienna. Alberto spoke about the importance of basic research and how animals play an important role in his field. Dr Marco Delli Zotti is an MD and member of Pro-Test Italia’s scientific committee. Marco spoke about the numerous surgical procedures which had been developed and perfected using animals. The event was then wrapped up Dario Padovan and Pro-Test Italia president, Daria Giovannoni, who thanked all those attending. Many in the crowd left with the sense that a turning point was in sight on the animal research issue. While the story in Italy is far from over, these developments may allow a space in the media that scientists can speak out of. While animal rights activists are allowed to spread their message unchallenged, the general public will lack the information necessary to make up their mind about the need for animal research. We should all hope that future animal testing stories are accompanied by the voices of Pro-Test Italia scientists and their fellow researchers across Italy. Italians will soon have to make a choice about who should be deciding science policy in Italy – the researchers or the activists. Which of these groups do you want controlling Italian science policy? This is just the beginning. Speaking of Research will continue to report on the developing situation in Italy. Also keep up with the latest information on the Pro-Test Italia website. 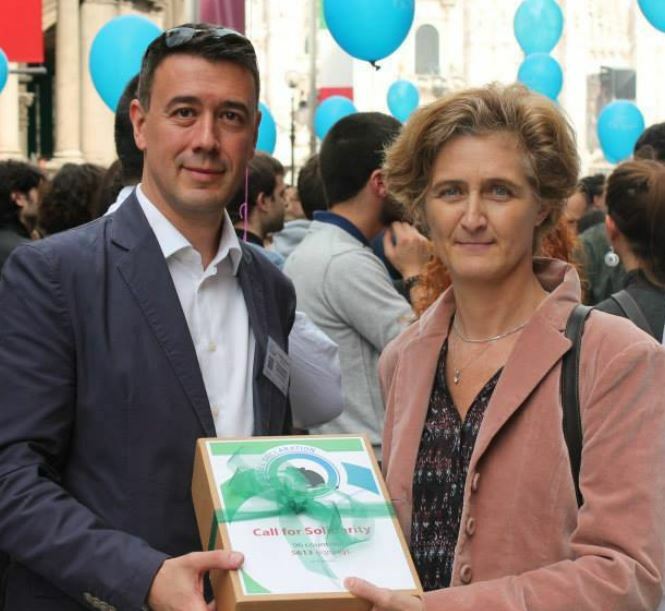 About 300 researchers and students from around Italy demonstrated in Milan on 1 June to increase awareness of the need for lab animals in biomedical research. The protest was a reply to what the researchers call a “witch-hunt” led by animal-rights activists. Also some nice coverage in The Scientist (with good pictures too). Unfortunately these articles spent too much time discussing the small number of activists, rather than the message being listened to by the large number attending the Pro-Test Italia message. Posted on June 3, 2013 June 5, 2013 by EditorPosted in Campus Activism, NewsTagged animal experiments, animal research, animal rights activists, pro-test, Pro-Test Italia, University of Milan. It has been a wonderful day: all those smiling, hopeful faces gave us hope for the research’s future in our Country. People, old and young together, stood tirelessly for hours, listening attentively, chanting and clapping: it was heartwarming, to say the least. On the other hand there have been reports of old people being heavily insulted and cursed by animal rights activists just because they were holding one of our balloons or leaflets. Such actions speak for themselves. Congratulations on such a wonderful day. Indeed, it was a clear demonstration by animal rights extremists that they prefer intimidation and harassment over civil debate. The reason is simple — they know what the outcome would be in a open, public debate. Perhaps the critical mass is already here to have world-wide demonstrations across the globe once a year? It would be truly wonderful.